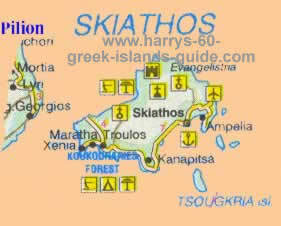 Skiathos is 43 nautical miles from Volos and has a population of 4,300.Its land mass is 48 sq. km with a coastline of 44 km. This is a wonderful and beautiful island with many, many sandy beaches and forests. Unfortunately the island caters heavily to tourism and has lost any pretense of authenticity. Many tourists from all over the world visit here. Spring or late September is probably the best time to visit and enjoy the island. There are 62 stunning beaches and stunningly beautiful vistas everywhere away from the main roads and the frantic press of tourists. Skiathos has some of the best swimming in Greece. The island is unabashedly hedonistic. The island buses stop with regularity at the beaches dotting the shoreline like jewels. Nearly all the beaches have a place offering lunch and many have windsurfing rental and various other watersport options. You should be able to find spots with umbrellas and beach beds. The last spot on the bus route, 12 km from Skiathos Town, is the legendary Koukounaries beach. This beach is rated the best beach in Greece. It's justly famous crescent bay of soft sand is fringed with pine trees that conceal several tavernas, hotels and campsites. Nearby Little Banana beach is the gay/nudist beach. Nostros Beach has the only sanctioned diving school in the Sporades. Take a half-hour excursion boat to Tsougrias islet for fine sand and excellent swimming. Walking paths form a network on the island and can lead to some fine discoveries. A walking path that begins just before the airport road leads 4 km to the island's last working monastery at Evangelistria. The monastery has a triple domed church and a garden courtyard. Skiathos Town is the only town of note. Here you can visit the house of Alexander Papadiamantis, one of Greece's finest modern novelists. 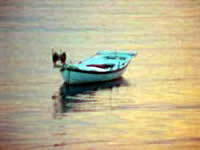 His Tales from a Greek Island is still a great description of Skiathos a century later. Skiathos Town is a maze of cobbled streets, trailing bougainvillea, and red-tiled roofs. It is built on two hills, each of which has a 19th Century church: Trion Ierarchon and Panagia Limnia. There is good shopping and you may find antique shops with genuine folk artifacts. A two hour walk from Skiathos Town on a well marked path leads to the small town Kastro. The town is now in ruins, except that eight of its original Byzantine churches still stand. (Christos has good frescoes.) Kastro has a good high view with a nice beach below. It's on the north coast, and like all of the north coast is subject to the meltemi winds, which can rage at times. If you visit in high season you'd better prepare yourself for long lines and poor service. Skiathos has a huge pick-up scene and lots of night life. Some people love the scene on Skiathos, and some are looking for a quieter more authentic Greek experience. As you might guess, there are many bars. The bars aren't cheap, but they're plentiful. Some cater to particular crowds: The Admiral Benbow Inn attracts English tourists, while the Kazbar often fills with a mix of Aussies and Brits. There are many eateries on the island, many with lovely views. The cuisine available ranges from tradional Greek to international choices such as Italian and even Swedish. Eateries geared to the tourist trade may be expensive. In 480 BC, King Xerxes of Persia was enroute to attempt to conquer Greece when he encountered a huge and damaging storm near Skiathos. (These waters are often choppy and turn many a tourist a bit green around the gills.) Xerxes put in for repairs to his ships and built a pillar of stone in the reef of Myrmes to warn others of the dangers there. History counts this as the first-known navigational aid. You can still see part of this famous pillar in the Naval Cadel School in Piraeus. Later, the Gizzi ruled the island and built the fort on Bourtzi islet. The present town near the fort was settled by refugees from Evia. The Skiathot navy fought against the Ottomans at Cesme and against the Turks in 1805. The most famous native is the novelist Alexandros Papadiamantis. He wrote more than 100 novelas and short stories, including The Gypsy , The Murderess , and The Man Who Went to Another Century . All his novels are set in island life. In high season this island rents its body and soul to tourism and neon. Visit off season if you want a less touristy experience. By Air: There are 4 to 5 flights a day from Athens and a couple a week from Thessaloniki. Many charter flights from Europe also descend on the island. Crete and Mykonos twice a week. On the island, there are frequent buses. Cars, motorbikes and scooters are available for rent. There is a taxi service on the island. Foot paths on the island make walking easy.